Curious to know whether or not you can open a bank account in Thailand with a tourist visa? Is it possible to transfer money abroad while in Thailand? Click here to learn more. The basic rule of prohibited jobs in Thailand is much like anywhere else in the world; if a Thai is capable of doing a job, a foreigner is prohibited from doing so. 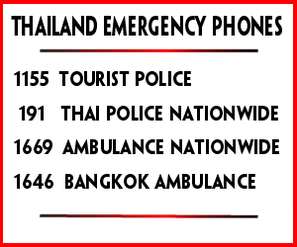 To view the list of jobs prohibited by the Thai government, click here. Unless you plan on entering Thailand for thirty days without a visa, obtaining a visa is the first thing you'll need to do. This section summarizes each visa and what is necessary to obtain one. Click here to find out more. Transit Bangkok can help figure how to get from Point A to B via sky train, subway, bus and boat taxi and I use it regularly. Although not completely flawless, Transit Bangkok can lead you in the right direction and make navigating the Bangkok transportation system much more simple. Seat 61 has long been a favorite of train travelers. The site is the passion of British railwayman Mark Smith and provides information on how to travel by train anywhere in the world — anywhere there are trains. Smith has written two books, Man in Seat 61: A Guide to Taking The Train Through Europe and The Man in Seat 61: Beyond Europe. If you're planning a train trip in Thailand or anywhere else in the world, this site is the best, bar none.